I only have a handful of eyeshadow palettes, and while they are lovely, and I enjoy using them very much, it is the single eyeshadows that I reach for on a daily basis. Trying to make myself look a little more presentable is my aim in the morning...there is certainly no "I woke up like this" at The Beauty Vine HQ, I can assure you!! So today I thought I would share some of the single eyeshadows that are currently occupying a draw in my little acrylic storage. I have recently had a tidy up and sort through of my makeup (gosh I love doing that!) and have collected a few favourites that are currently tickling my fancy to chat about and swatch for you. I have a few high end, and a few affordable options, and I feel that they all fall into the neutral category. I think these particular shades would look beautiful with any eye colour...hopefully something for everyone! 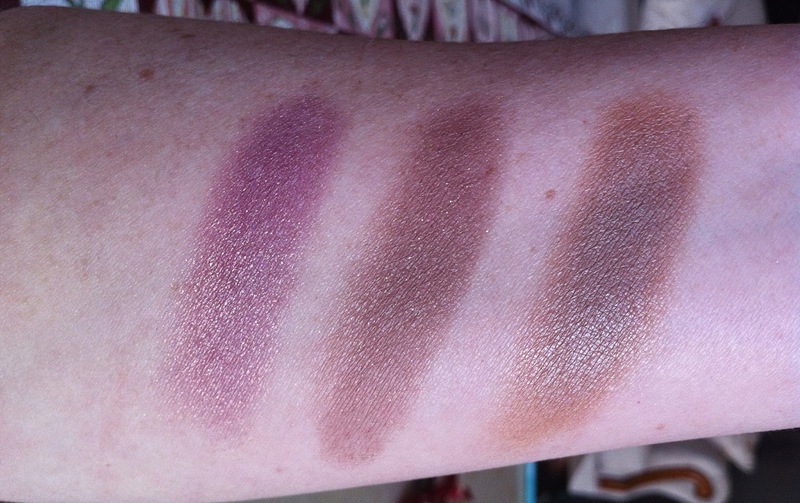 One feature they all have in common is that they all contain some degree of shimmer, and are mostly mid-toned shades. I remember seeing a video from Emily Eddington from Beauty Broadcast ( EmilyNoel83 on You Tube) about single eyeshadows that work well as a one shadow look some time ago. The idea being that the shades will catch the light on your lid, and then when blended into the crease take on more depth to give your crease definition without the addition of another shadow. I typically use two brushes, a flat shader brush to pack colour onto the lid, and a fluffy blending brush to diffuse the colour into the crease. You could certainly get away with one brush, by just using your finger to pat the colour onto the lid, and then blend with the fluffy brush. I have two brushes pictured below from Bdellium Tools, the tapered blending no.785, and the flat shader no.777. I also enjoy the Real Techniques eye brushes very much. If I feel I've blended the shade too high, I will take a dab of pressed face powder, and blend with the fluffy brush to soften the edge. It's simple, quick and easy, three things I need in the morning when I am trying to get four children ready for the day! Laura Mercier - African Violet.... Now I don't own any Laura Mercier eyeshadow palettes, and I believe this shade is in most of her palettes. Some may not consider this a neutral shade, but I do! I think it works beautifully as a one shadow look. 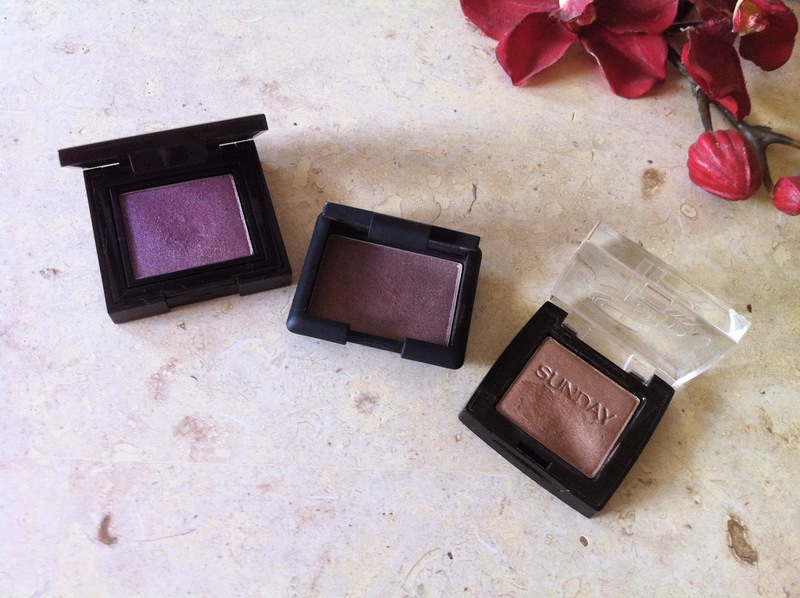 The light catches the golden shimmer, and the pretty violet undertones look deeper and richer in the crease. I have also found that when patted over black liner along the lash line, it morphs into a beautiful antique gold shade...really pretty! NARS - Ondine...I blame Anna from Vivianna Does Makeup for this one. It isn't the most pigmented of eyeshadows, however it is easily built up, blends beautifully and I just I love the tone of it. Brown with a hint of plum/purple. Love. Sunday Riley - Lady Godiva... Another well known UK vlogger Ruth Crilly from A Model Recommends used this shade a few months ago in one of her videos, and I was immediately drawn to it. I managed to track it down at Mecca Cosmetica here in Australia, and it is now one of my most reached for shades. As you can see from the photo above, I have made quite a dent in it! It is so unique to me, so creamy and buttery, on the lids it's a warm toned taupe, and then blends out into a beautiful rosy, tan hue...I'm seriously obsessed with this shade! Highly recommend! Wet'n'Wild - Nutty...my lonely only Wet'n'Wild shadow, I have always meant to explore their 3 and 6 pan palettes, but just haven't gotten there yet! 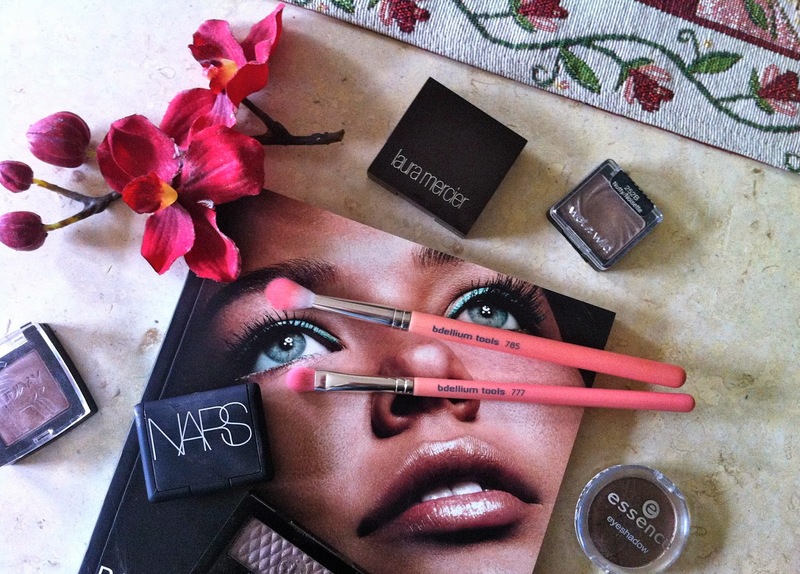 It is a gorgeous taupe, warm undertones, smooth and easy to blend, I love this on the lower lash line as well. Rimmel London - Backstage...packs a punch in the shimmer department, but more of a cooler tone in my humble opinion. You can really get a glam look with this shade, and easily transition to a night time look with some liner and lashings of mascara. Essence Cosmetics - Metropolitan...is more of a deep brown, and probably the darkest shade of my current faves. 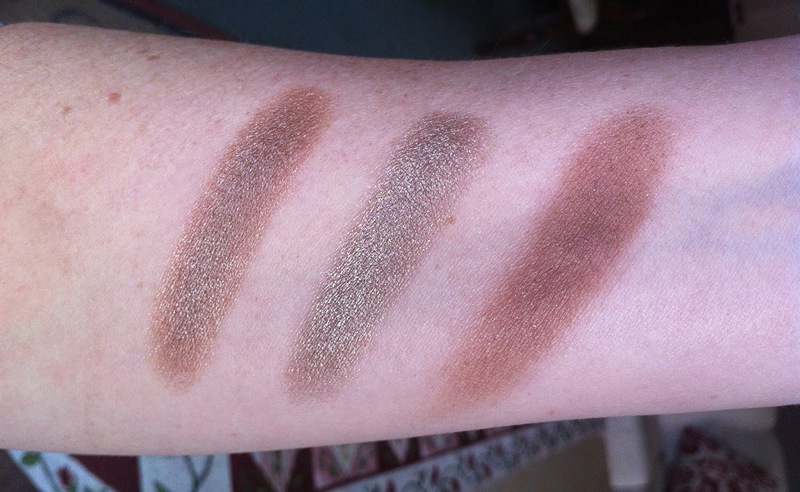 However, it blends out really nicely into a lovely warm brown, and just fades away into the skin perfectly above the crease. I try to be as sensible as I can when it comes to spending my money on a single eyeshadow. In reality, it is not the most cost effective purchase! However, I am really pleased with the high-end shades I have shown you today, and would not hesitate to recommend them. Have you tried any of these shades? What are you favourite single eyeshadows? Do leave a comment below, I'd love to hear from you! 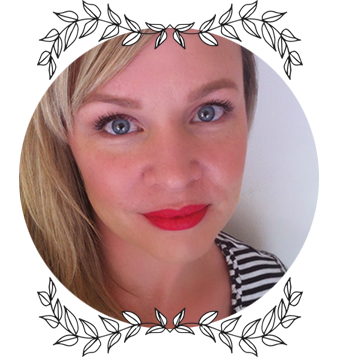 I would like to share some lovely, affordable Australian Skincare products with you today. I was honored to be offered the opportunity to try these products, and have put them through their paces ( myself and my children!) to review for you today. 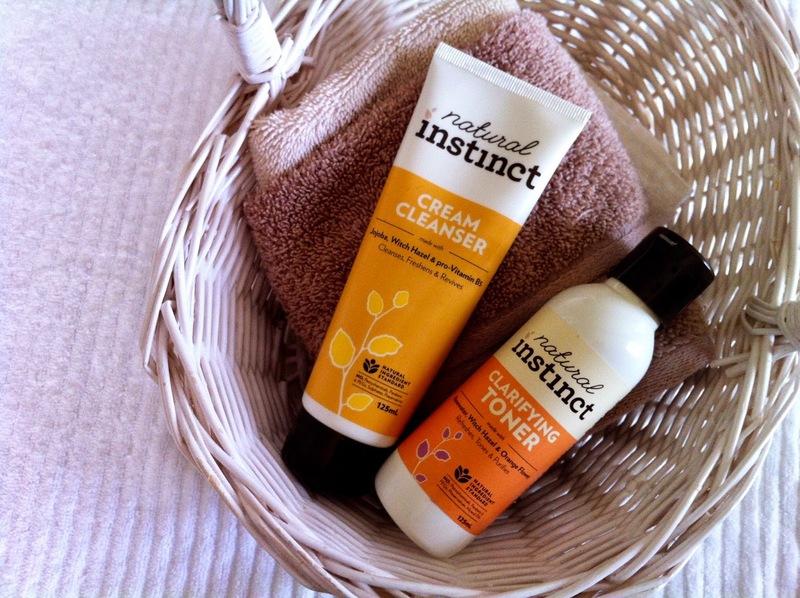 Natural Instinct is an Australian brand which has been providing natural, organic skin and hair care products for the whole family for over a decade. I have reviews of three body products, and 2 facial care products to share with you. I hope you find it helpful! I have noticed over the last few years that we, as consumers, want more and more from our products. Skincare companies are rising to the challenge of producing not only a quality product, but where possible using natural and organic ingredients, which have been sourced ethically and responsibly, whilst doing no harm to other living things, and concurrently having the greatest respect and concern for our environment, not only in production, but also in the manufacture of the packaging in which they reside. Whilst not every consumer feels equally as passionate about these factors, there are many companies, both small and large, that are delivering the goods. There are certainly more and more options for those wanting to use natural products, not only for themselves but for their families as well. Now, whilst I do not place myself exclusively in a strict "Green Beauty Only" category, on my travels through the world of beauty and skincare, I am certainly discovering some lovely brands, with lovely products. And I like them. This is a thick luxurious cream cleanser, full of lovely oils to gently but effectively remove makeup and cleanse the skin. Some of the oils include Safflower Seed Oil, Calendula Flower Oil, Avocado, Rosehip and Jojoba Oils. Rose Flower water and Witch Hazel extracts are also included, along with the essential oil blend of Lavender, Lemon and Sage. Even though I do have oily/combo skin, I prefer to use a cream, lotion or oil cleanser in my skincare routine in the evening, because I feel that they are more protective, and don't strip the skin of it natural oils. You only need a small amount of this cleanser, this handy tube will last you very nicely. I massage the cleanser onto a slightly damp face for about a minute, then remove with a hot flannel/washcloth. If I have been wearing spf, or a lot of makeup I will do a second cleanse ( most days I guess ) This cleanser also works beautifully for me in removing eye makeup, and I am always grateful to find cleansers that can be used on the eyes without irritation. My skin feels soft, comfortable and is clean without feeling tight or dry. I think this cleanser would suit most skin types, particularly normal to dry. If you are prone to acne like me, then just make sure to remove it thoroughly with your warm flannel. If you find it a little too rich, just emulsify a little water with the cleanser to thin it out. It has a very subtle scent only, barely noticeable to me, and I am sure would not be offensive to those who are sensitive to fragrance. Refreshing and gentle, this hydrating toner is a pleasure to use. I typically prefer hydrating toners in a spray bottle, and have decanted this into an old empty spray bottle. You could, of course, use it on a cotton pad and sweep over your skin after cleansing, I just like the feeling of misting my face like a mad woman ( I have been known to sometimes go a bit overboard ) after I have cleansed. Gosh it feels nice! I don't typically rely on toners to remove any residual cleanser, that's the job of my beloved flannel! This water based, alcohol free toner has Glycerin as its second ingredient, which is going to hold the moisture in your skin ( also known as a humectant ) and also includes Witch Hazel, Rose water and Orange Flower water, all known to soothe and hydrate the skin whilst providing anti-inflammatory benefits. Nice. 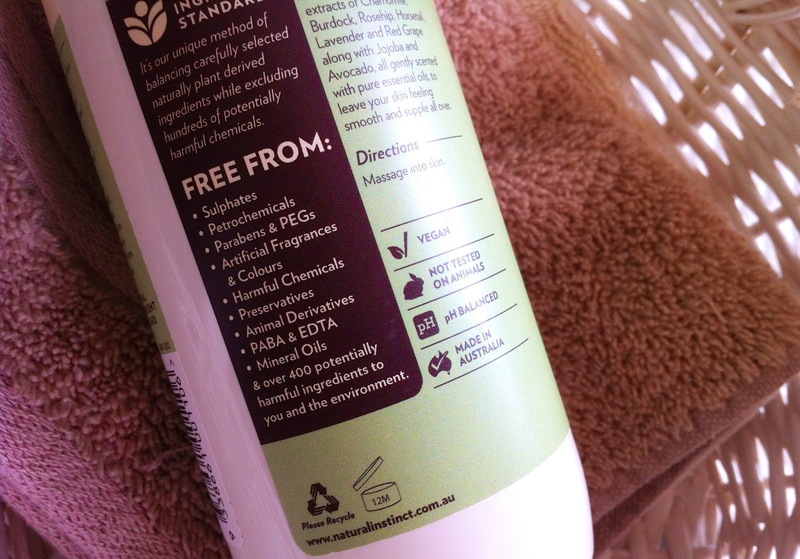 Tried, tested and approved by my children and I, this extra gentle wash is lovely. Now my youngest child is 3 years old, and my eldest is 10 years old, so not exactly in the baby stage anymore, however I still like to use gentle products for their skin, which like mine, is prone to dryness and winter excema. I would definitely recommend this gentle product for babies and young children. When my four were young babies, I would always have an evening ritual consisting of a lovely warm deep bath, a lovely long feed, and then cuddles and bed. I would always have a gentle baby wash on hand, normally with a little bit of lavender in it, which I believed helped not only them to relax, but me as well! This lovely gentle baby wash contains a calming blend of Lavender, Lemon and Sage essential oils, and like all of the Natural Instinct products, is Sulfate, Paraben, Preservative, Petrochemical and Mineral oil free ( among other exclusions ). It works well in the shower as a body wash, and also makes a lovely, relaxing bubble bath. Thumbs up from The Beauty Vine's offspring! On arrival to The Beauty Vine HQ, this one went straight into my shower, and will probably be featured soon in an empties post! A sulfate free, gorgeous smelling body wash that still manages to lather nicely ( love my bubbles ) without drying out your skin. Citrus essential oils are some of my favourite scents. I find they help to clear and refresh my mind, which by the end of the day is barely functioning (which my children and husband will attest to ). I used both Lemon and Lime essential oils in my labour and birth with my fourth ( and last! ) child....they were brilliant for simultaneously clearing and calming the mind. The Energising kick in this body wash is thanks to a blend of Lemon, Lime, Lemongrass and Geranium essential oils, with a subtle hint of ginger for warmth. Love. And it has a pump. Love that too. It is also available in a Relaxing formula, which contains a similar blend of oils as the Baby Body wash. This deceivingly lightweight lotion packs a punch in the hydration department. It absorbs quickly and easily, whilst still leaving your skin feeling moisturised and comfortable. You can thank a good hit of Sweet Almond Oil for that, along with Wheatgerm, Avocado, Rosehip oils, and Mango Seed Butter. Again, the combination of Lavender, Lemon and Sage essential oils provide a lovely calming fragrance. I like to slather this all over my tired body after my evening shower. A little goes a long way with this lotion as well, and the large size, like the body wash, I think represents good value for money. I have also used this lotion on my children after their bath/shower, more so in winter when their skin can be dry and itchy/irritated... and if I happen to forget and start throwing their PJ's on they will certainly remind me... "Mum!...You didn't put my cream on!" You can find the Natural Instinct website Here . You will find a good amount of information about the company, and of course the products, complete with all ingredients listed. Natural Instinct also have a hair care range. You will find an information page about the ingredients they choose to include in their products, with a simple, easy to understand explanation of each ingredient and its' benefits for the skin. There are also links to online stockists, as well as information regarding availability in Pharmacies across the country. As the time of publishing this review, I could only find one online stockist who would ship internationally, unfortunately at a rather hefty cost. Hopefully these lovely products will be available internationally soon! Have you tried any Natural Instinct products? What are some of your favourite skincare and bodycare products and/or brands? I would love to hear from you in the comments below, feel free to say hello anytime! As I mentioned in the beginning of this post, these products were sent to me for review. I feel very lucky indeed to be given the opportunity to do so, and will always be honest in my reviews, whether I have purchased the item or it has been gifted. Cheers. Essence Cosmetics XXXL Shine Lipgloss | Swatches and Chat! When it comes to lipgloss, I am really not too fussy. Aside from the shade/colour, the most important feature for me would be that it HAS to feel good on my lips. Not only on application, but as it wears as well. I am not at all bothered if a lipgloss doesn't last long on my lips, I am happy to reapply if it feels nice! On a daily basis, it will often be a gloss, or a tinted lip balm that I will reach for in the mornings. They are all quick, easy, and don't require a great deal of precision ! I don't mind if a lipgloss has a bit of tackiness to it, it just helps it to last a little longer. 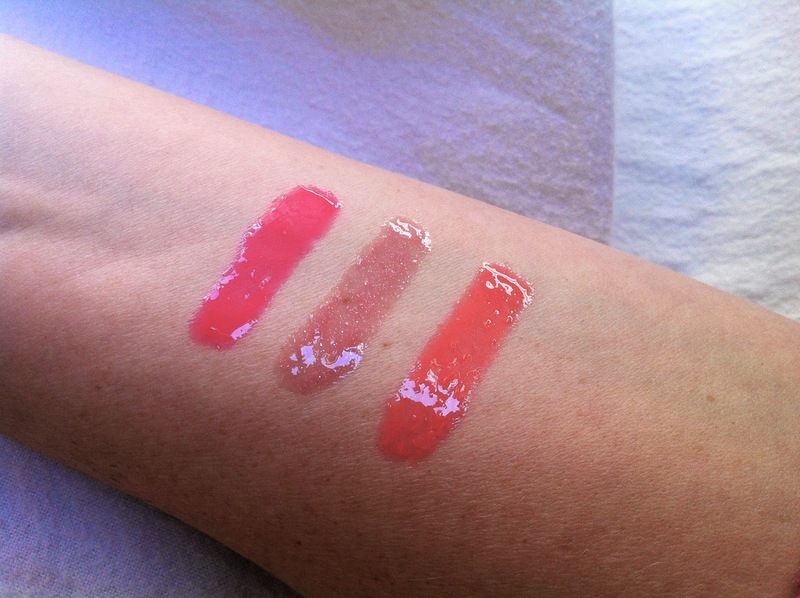 Anything that falls into the blatantly sticky category gets the boot from me ( Lancome Juicy tubes I'm looking at you ). If there are any lipgloss lovers in the northern hemisphere reading my drivel...you might like the look of these particular shades for your summertime shenanigans! Concurrently, if you are deeply embedded in an icy cold winter like me, and don't give a toss, throwing caution to the wind and wearing whatever shade of lipgloss you feel like...then these may just tickle your fancy as well! There are many pretty shades, they are inexpensive, and they feel good on your lips. They are very shiny, as you see from the photo above, and they smell good too! They have a nice, long doe foot applicator, and are available in 11 shades for the bargain price of $3.25 AU each. I have found these to last for about 2 hours on my lips, which I think is pretty reasonable for a gloss. I always find the Essence displays in Target and Priceline hard to walk past! They have suprised me on many occasions with the quality of their blushes, eyeshadows, lipsticks and nail polishes. Have you tried these glosses? Do you have a favourite shade? Do let me know in the comments below, I always love to hear from you!